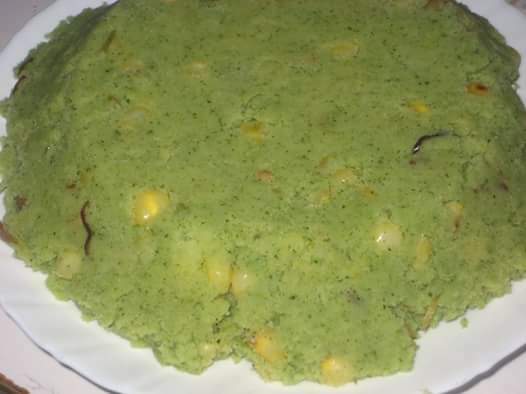 A Kenyan favorite which is basically mashed potatoes with maize/corn with boiled and blended pumpkin leaves adding the green color and flavor. ➮¹/₂ kg Pumpkin leaves(without the stalks). Boil the maize until soft and set aside. Meanwhile, in another pot, boil the potatoes in salty water until cooked and ready to mash. In another separate pot, boil the pumpkin leaves in salty water for about 8 minutes. Drain off the water and blend to form a green thick paste. When all the three ingredients are ready and hot, combine in one suitable pot and mash until well combined and potato fully mashed checking that the salt is enough. The final product should not have too much of the maize. To make it tastier, cook onions in a pan with little oil until evenly browned (caramelized). Add to the mukimo and mix until fully combined. Tip: In place of the pumpkin leaves, you can use fresh peas to mash together with the potatoes to give the green color and a different great taste.